The advent of social media and the internet has brought an increasing push toward a ‘meme’ culture but, what does this all mean? Until a short while ago I didn’t really understand what this all meant. Sure, I knew what a meme was but I didn’t really understand what the purpose of a meme was. Although not all memes are jokes the key difference between a meme and an offline joke is the speed of transmission and the fidelity of a meme’s form. Basically, an offline joke is only as fast and transmitted as far as people are willing to tell the joke whereas with a meme it can be transmitted simultaneously by thousands of people all across the world. Thus, space and time are overcome when a ‘joke’ is made into a meme. 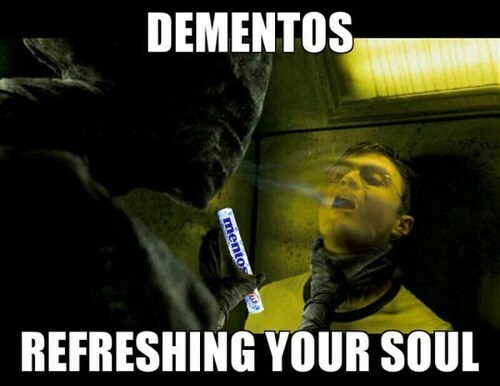 Let’s take the example of Harry Potter in understanding the components of a meme. Davidson (2012) notes three key components which we will look at in a bottom up fashion so 1) The ideal: in this example the idea or concept is the Dementors attacking Harry Potter in Harry Potter and the Prisoner of Azkaban 2) the behaviour is taking the image of Harry Potter and manipulating that image then uploading this to the internet and 3) Manifestation of the meme in this example is how it is shared, viewed, changed and commented upon. In short, the manifestation of the meme relates to the observable external phenomenon which records its existence. Finally, the image has a clever punch line that makes the meme ‘funny’. Let’s take a closer look at current meme’s which follow a simple formula of an image in the centre, first line of advice and a second line of advice usually a punch line. For the meme to be successful it must have a cultural undertow that is relevant, relatable and understandable by the audience. 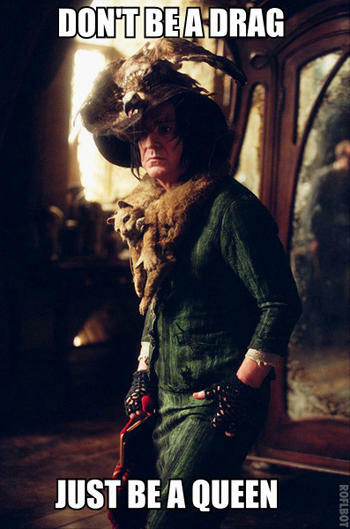 In this example taken from Harry Potter and the Prisoner of Azkaban Snape is seen in drag costume or Neville Longbottom’s image of making Snape less formidable and scary with a reference to Lady Gaga’s song ‘Born this Way’. Today, meme’s move beyond the image with a catchy punch line to more complicated pieces of media including GIFs and viral video. The main proponent is the speed of transmission and whether the piece of media is replicable and malleable that is it gains influence by its use or how many times it is viewed. So, you may be thinking what in the world is a 27 year old doing being a big fan of Harry Potter? But, the truth is I grew up with the books, I remember picking up my first HP book as an 11 year old and I guess it went from there. Finally, let’s look at meme’s in the form of GIF’s – graphics interchange format – which are a bitmap image format widely used across the internet. This format was first brought to prominence with the ‘Hamster Dance’ and ‘Dancing Baby’ but today is used widely across multiple social media platforms. Davidson, P (2012) ‘The language of internet memes’, in M.Mandiberg (ed) The Social Media Reader, pp 120-134 New York: New York University Press.